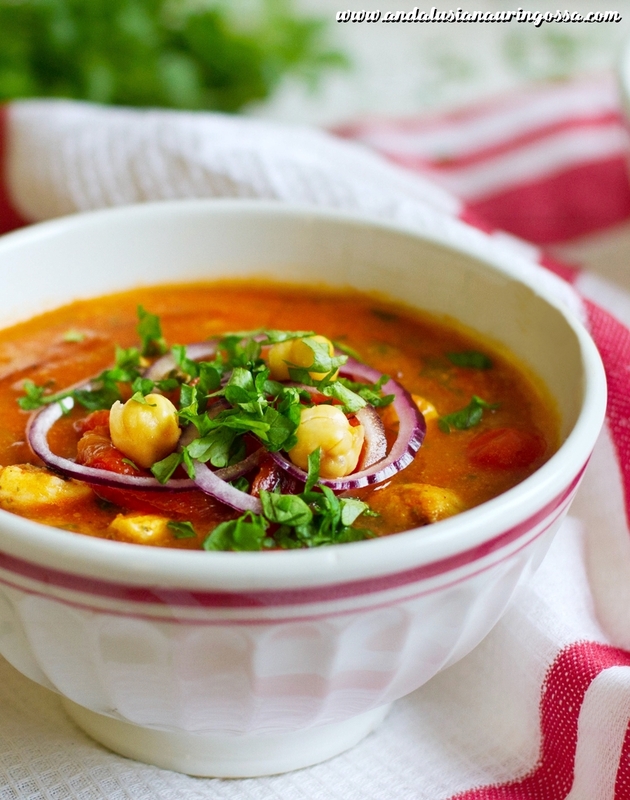 This Mediterranean chicken soup with roasted peppers and chick peas is comforting, yet healthy and bursting with Mediterranean flavours! All the snow and wind makes you crave for something comforting and warming? The spring being just around the corner you feel the need to at least try and eat healthier? All you really want is to escape under Mediterranean sun but the holiday's still such a long way off you can't even bear to think about it? You have a crowd to feed which invariably follows either gluten-free, vegan and/or kosher diet and you should come up with something that they can all eat? Take a deep breath and relax as I've got just the recipe for you! 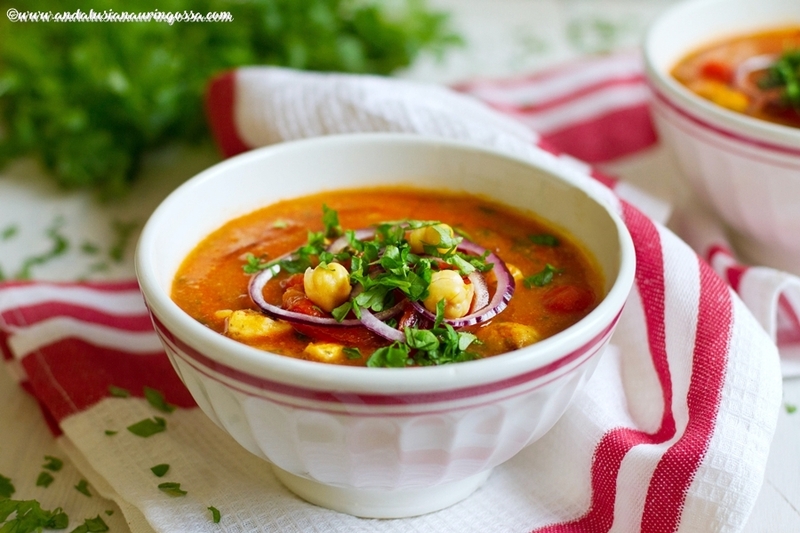 This Mediterranean chicken soup with roasted peppers and chickpeas is rich and comforting, yet healthy. The secret to it's creamy texture? Puréed chick peas. Soup itself is kosher and gluten-free, but for a vegan version you could substitute chicken with soy strips (dry weight 125 g) or, if soy , too is out of the question, with giant white beans. Start by roasting the peppers under a broiler until the ski n is black and bubbles. Let cool, covered, until cool enough to handle. Pull off the skin. Measure 2 peppers into a food processor along with the drained chick peas and stock (leave a couple of chick peas for serving). Blizz until smooth. Slice the remaining pepper for serving. For a short cut you can use shop-bought roasted peppers in a jar - if possible use ones stored in oil as their taste is more mellow. Heat a couple of tbsp of oil in a coated pot. Sauté onion and garlic over medium heat until they're soft. Add pimentón and continue cooking for a couple of more minutes. Cut chicken to about 2-cm cubes and add into the pot. Season and sear. Add tomato concentrate and sugar along with chickpea-chicken stock mixture. Stir and bring to boil. Add cherry tomatos and pepper strips and simmer for about 10 more minutes. Season with red wine vinegar and herbs. heck the taste and season as needed. Divide into serving bowls, sprinkle remaining herbs on top and serve. Any of you dying for a Mediterranean getaway? What would be your dream destination?